Body: 7/8 Swamp ash Neck: Birds eye maple with ebony fingerboard. Brown sunburst finish [although the pictures make it look like the 'fireburst' it is not] Black Sperzel locking tuners.Black Graphite nut, DiMarzio strat style floating bridge. Currently with all 5 springs. 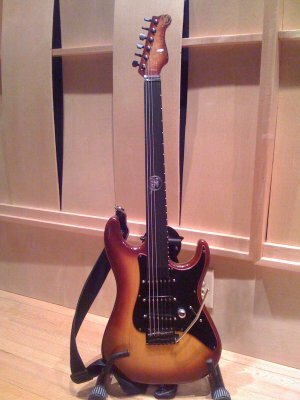 Original wiring was Seymore Duncan Jeff Beck in the Neck position, with 2 OBL single coils in the middle and Bridge position. Pickguard assembly came off completely by way of a Molex Style connector to the jack. Guitar body has the brass inserts with the small hex bolts for the pickguard. I have since made up a pickguard with 3 single coil VanZant hand wound - [original ones] But I go back and forth between the assemblies sometimes when I change strings. or as needed for something I'm producing. The JB in the neck is kind of a 80s fusion inspired thing.Pictured with the original VA fret protector in place. Frets have never been leveled. No major neck adjustment has ever been done. Intonation and tone are AMAZING. With more than 20 guitars of all kinds it still remains my main go-to instrument.